The climb starts out of Interlaken, in Unterseen (567m), where a good and wide road climbs surprisingly steep up to Habkern (1067m). The road that follows the Lombach river then becomes a very narrow road that first descends to a bridge (1041m) and from here it is again a steep climb up with some easier stretches along the way to the top. It is 8.19% on average from Unterseen and 8.82% from the Habkern bridge. It is a very nice and mostly lonely road up from Habkern with lovely views higher up and at the top area. 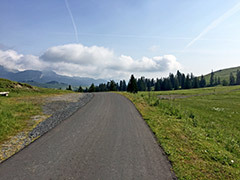 The road ahead continues to Ällgäu (1710m), but asphalt runs out at 1683m a little before. One could possibly go down the other side on an asphalt road (at first) that turns off at 1586m at a crossroads for Ällgau, but when you get down the valley there it will turn to gravel and the last part before joining the asphalt road down Hübeli (1090m) seems a bit bad, but I do not know if it is too bad for a road bike or not – likely it is possible to use. The high point of the road before the turn-off is at Färrich (1603m) and it is wortwhile going a bit along this road even if you decide to turn back again as it is a lovely and perfectly fine road with good views. You can also start the climb at the bridge in Habkern if you have happened to come here from Waldegg, which is likely a very nice road choice! Not sure if the Käserei by Alp Lombach is also a restaurant as it looked rather closed when I passed by, but it should be a restaurant (I was probably just a bit early). There is water down in Habkern. Another interesting climb in the area is up to Chüematte/Leimere (1686m) – from Birmse (628m) close to the start of the road up to Habkern, the Beatenbergstrasse and minor roads takes you there in 11.6 km and 1058m with 9.13% steepness. The Grüenebergpass (1554m) is only for mountain bikers (if you wonder).